He really is good, Matt is... pointing these things out to us. I read this article quite a while ago and came across it again.. When doing a lunge or squat, do NOT let your knees go past your toes. We ALL know that is TRUE... You'll hurt your knees, right? Well, read on.. Correct form? Maybe.. or maybe not. Let your body do what it naturally does. I saw this on TED, Charlie Todd's Improv Everywhere. Just watch, it speaks for itself... it'll make you smile! Just wanted to post this photo John took of Jane and me when he dropped us off at the start area of the marathon. It was a 7/11 and had a line, but much shorter than the port-a-potty lines. 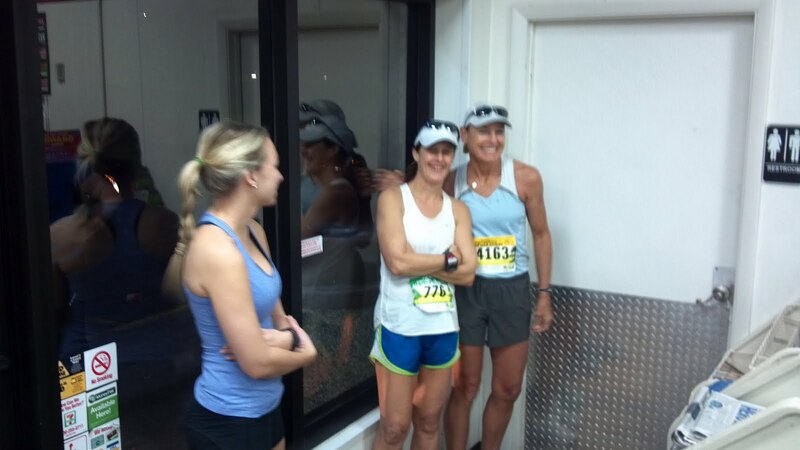 Another hot and humid day for the A1A Marathon and Half Marathon yesterday. At start time (6 am) it was 73 degrees with something like 85% humidity. The temperature only went up from there to around 80 at the marathon finish, with mostly sunny skies. It's funny--isn't it?--that a week ago Sunday we had a cold front go through (see Miles for Meso post) and it was 49 degrees at 7 am. THEN last night a milder cool front went through, AFTER the marathon, with temps around 60 degrees this morning. ??? Jane and Mark ran the marathon, and I ran the half. I only began thinking about running this right after the new year, so "training" was minimal--average 30 miles per week with a couple 10-milers and a couple 12-milers for long runs. Oh, and a torn hamstring tendon that gives me some problems. But what the heck, my PT and ortho dr have given me the go ahead to do whatever running I want to do. 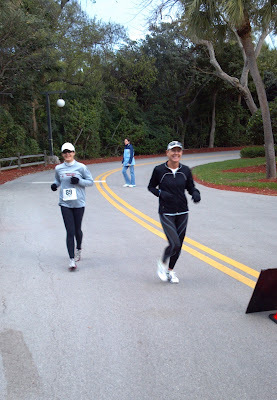 Mark, Jane, and I ran about the first five miles together at around 9 minute pace. I let them go as my leg was beginning to hurt and my goal was to just finish this thing running, but it was great fun for me to be running with Jane again! 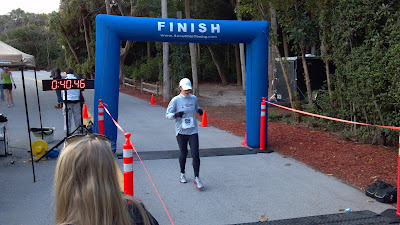 I was able to keep my pace for the most part, slowing just a bit, but doing okay considering everything. The heat was harder on the marathoners, obviously. It was especially brutal for Mark. He's a big guy and it is just so much more difficult to dissipate the heat when you have more bulk; it's a body mass to skin area ratio thing. Here's Jane almost to the finish..
Maybe because EVERYONE ALWAYS EXPECTS it to be hot and humid, with of all that negative vibration, it ALWAYS ENDS UP being hot and humid... we get what we expect to get. So I have an idea... what if next year everyone visualizes in the weeks before that we have perfect racing weather for A1A... could help, you know... wouldn't hurt to try, would it? "Sh*t Barefoot Runners Say." It's pretty funny! Here it is, enjoy! Miles for Meso 8k at the Park - My First Race in Years! It was 49 degrees this morning with a 17mph north wind at the start of this morning's race down A1A and back. 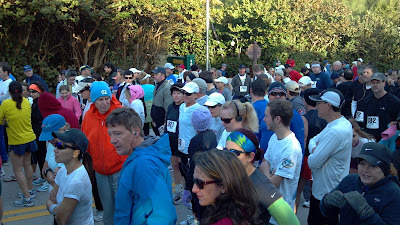 It was the Miles for Meso 8k, a very good cause. The race was directed by one of our Boca RoadRunners, Larry Davis, who has mesothelioma. He's such an inspiration, always has a smile and a good word for you, and continues to run and race, for years now, since his diagnosis! Such fun this morning.. 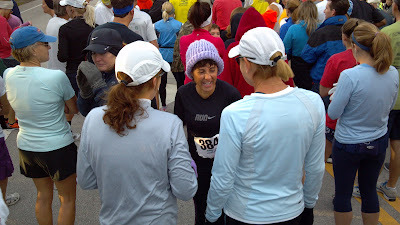 I love the race environment--everyone is so upbeat and friendly! AND we had good race times all around! 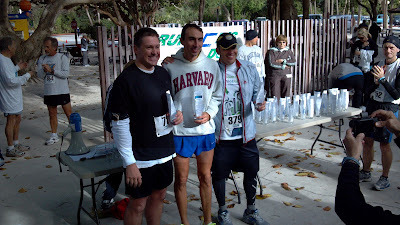 My runner Mark had a fantastic race, one week out from his marathon, the A1A Marathon down in Ft Lauderdale next Sunday, placing 2nd in his age group! Jane and Marie both finished 3rd in their respective age groups, and I finished 2nd in mine--was very happy with that! Jane will also be doing A1A next Sunday. Matt Fitzgerald's "10 Biggest Sports Nutrition Myths"
I am a big fan of Matt Fitzgerald's writing, have quite a few of his books. He doesn't jump on the bandwagon of every fad or trend that comes along in the endurance athletics world; he investigates for himself, and reports from that investigation and from his own experience. He just seems to me to be a real genuine person. His books and articles are very well written, understandable to interested athletes, and entertaining as well. Matt wrote an article recently for Competitor.com entitled "The 10 Biggest Sports Nutrition Myths." REQUIRED READING for all my distance runners!! Here is the list, but follow this link to read the article for yourself; Matt says it much better than I can. 1. Taking in simple sugars during exercise is bad. 2. There is an optimal macronutrient ratio. 3. It's necessary to carbo-load before races. 4. You should drink to completely prevent dehydration. 5. Eating more fat will increase your endurance. 6. Muscle cramps are caused by dehydration. 7. All sports drinks are the same. 8. Most runners eat enough carbohydrate. 9. Runners need to eat as carefully as non-runners. 10. Supplements are necessary for maximum performance. Here are a few books Matt's written (or written with others) that I recommend runners to read. If you click on the book it will take you to Amazon.com where you can purchase the book. Dream big everyone.. have faith and be happy in everything you do. John has been after me for quite some time to carry some form of identification with me when I run (and get him the same thing), so going down my "to do" list and seeing that way down on the bottom, I figured it would be kind of an easy one to do. I found Road ID. They have quite a selection of products to carry ID, from wristbands to putting one on your shoe. I chose the slim wristband for both John and myself. They come in many colors--black, blue, orange, red, green, pink, and purple.